Everything needs to be planned. Once you plan things, things will work out so much better for you. But once you plan them, you will be able to systematize them. You will be able to repeat and then you’ll be able to measure and you will be able to improve and you will be able to have other people do things for you instead of you doing it, if it is systematized and organized. Once you sort out one campaign and set a timeline, you can use that as a template for something else. But no matter how quickly you organize it, it needs some basics. So I’m just going to run through some very short and quick basics for you. So remember, it’s very important that you think of the things as campaigns, that is important. So you must have a start date, that seems obvious, it’s not today. If I have thought of it, if I’m going to have a product launch next month and I’m going to organize everything, it doesn’t just mean okay, we are organized. No, your campaign is going to have a start date from when your material starts to be released, it’s not today when you start planning it out, it’s when the campaign is going to operate. It needs a start date and therefore it needs an end date. So, just remember this is the campaign, this is not the actual project of setting up with a campaign. But you still need a lot of information. So you need a start date and an end date. As part of the project, so there’s two things going on here, it needs goals for the campaign and it needs an audience, you need to know your audience. Is it for everybody? Is it just for the UK? Is it for your worldwide audience? Is it just for a portion, just for your local area, for people who are on a certain list or something like that? You need to know who is involved in the work. You need to know what material will be required and you need to know the designs for everything involved. And then there will be, at the end there will be a measurement and a follow-up. 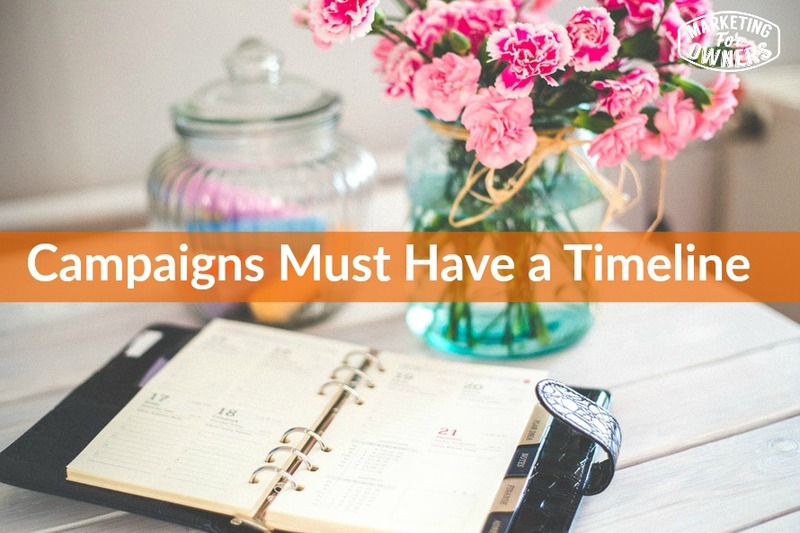 But during the campaign you need to plan out so the start date, what is involved at the start of your campaign? Is it a Facebook ad? So write that down. In fact, you could even put it on a post it note, stick it on the door, on a wall. So post it note, the Facebook ad. Facebook ad to perhaps a post, a detailed post detailing something or other. Perhaps in that post there will be an opportunity to sign up for a webinar or special webinar relating to that subject. So, sign up for a webinar, then part of the campaign, so that post needs to written and it needs to be live on a certain date. Yes, someone needs to remember to do that. The Facebook ad needs to run and needs to have an expiration date because you don’t want be paying for that forever. Then once that has gone out, then there needs to be follow-up e-mails. Obviously you have set up the webinar and everything like that, but there needs to be follow-up e-mail. There needs to be a first one to say that you, there needs to be one a little while later to send them their workbook and explain a bit more of what is going to be involved, here’s your workbook. Maybe one a little further on and each of these are post it notes and goes up on a timeline and write the date of when it needs to be, when it’s going to be live. Then you probably need maybe another follow-up with a checklist and by the way, I am just talking webinars and things because these are extremely popular and not a lot of people will turn up, about 25% of the people who signed up will turn up for your webinar. If you can get that up to 35, 40%, maybe 50%, you are doing well and these are the tricks that will do it. So the day before here is a checklist, or on the day, here is a checklist. Halfway through the day, don’t forget later on , these are suggestions, these are e-mails. Then of course, your webinar. After that, then a follow-up. What date does that go out? Who else do you contact? What about the people who did not turn up? Do you send them a replay? The people that did turn up, what do you send them? The people that bought, what do you send them? So you have now got little separated little lines come down in your little post it notes and the message sequence for those and the ones who didn’t show up, “Look what you missed, but we are going to give you another chance and maybe you send them a replay etc. But this is just an example, these campaigns involve a lot. If you’re going to have a sale even, just a simple sale, when does the sales start, how do you communicate that sale? What channels? How do you follow up? If you’re putting an ad, when do you take it down? What else is involved? Who is involved? What else needs to know if you’ve got a shop, a store, do you have to put things up in the store, in the window? Do you have to take them down once it’s finished? Do you have to get a printer to deliver? Do you have to put an ad in the paper? And when is the end date? And then when do you review and measure? All these things need dates. And I’m sorry, planning, project management, it may sound boring but this is how things succeed, this is how people get organized. Once you’ve met that one, you can put that on to all sorts, into spreadsheet into a Word document into a Google document, you know Gmail it’s free so it’s up there, you can put into a Trello board, even better. You can put the system into Process Street, all of the things I am mentioning are free, make your life better. You may use Asana, we use Trello. But a Trello board, excellent for this. Then when you come to do another one, you can duplicate that Trello board or that system or that Word document and you can reuse it, you can even take little pictures and insert them, you can make a PDF. You can do all sorts, it makes your life easier and the next time it comes to having a sale or a promotion, you can say here is our system for organizing a sale. And then you’ve got a system which you didn’t realize because you didn’t set out to write a system, you set out to document the campaign. Clever, eh? Okay, it is Thursday it’s time for a drive time podcast. Now I was recently at the New Media Europe and I met this wonderful couple, boy are they tall. Julian Illman and Kathryn Bryant. Now Kathryn is tall as well, Julian is mega tall and he looks a bit like David Bowie, in my personal opinion; I’m sure I am not the only person who ever told him, obviously when David Bowie was alive. Yes, before you think that. 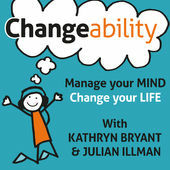 Their podcast is called the Changeability podcast. Now it’s a discussion and interviews with people to empower and inspire a happier, successful life or business with practical mind management and change techniques, tactics and tools. They have a website at brilliantlivinghq.com. And I’ll tell you what, not only are they lovely, but this is an award-winning podcast, this actually won the best self-help podcast at the UK Podcasters Awards in 2015. But they are lovely. If you hear them on the podcast, when they’re chatting with each other they’re just got a lovely about them, you think “Oh, I’d like to meet them.” But really, once you meet them, at the event, everyone seemed to know them, they are so darned friendly. So it’s not all wishy-washy woo-hoo self-help meditation and everything, it’s just ways of looking at change and improving your life, your business. I strongly recommend it, it’s really really good. Go to their website, see what you think, give them a review on iTunes, give them a good review and give me a good review over there please. I’ll be back tomorrow with another weekend challenge.